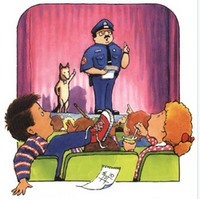 This week in Grade 2 we are reading an excellent realistic fiction book called Officer Buckle and Gloria. Children love this book because of the charismatic and fun character of Gloria the police dog. It is a story about practicing safety, but more importantly it is about how friends can help us in many ways. There is also the subtle lesson about how jealousy can end friendships if we aren't careful. I know the children will love reading this story this week. We have many copies in the library. If you child enjoys the read, encourage her to check it out again from the library this month.